The H.Upmann Regalias is a great morning Habano, a light-medium Petit Corona, 5.1” (129mm) long, of 42 ring gauge, and comes in a 25 cigars box. It has a nice construction and burns very well. It is a perfect cigar for a morning smoke, or an afternoon smoke, that can appeal both to seasoned smokers and newcomers to Habanos. The cigar has a nice complexity of flavors, toasty tobacco, cedar, coffee, sweetness of honey, some spices, some leather and some floral note. The constant creaminess of the cigar makes it one of the best Petit Corona out of Cuba. Fully handmade, it is also a cigar that has a great potential for aging, which would allow the aromas to open even more. 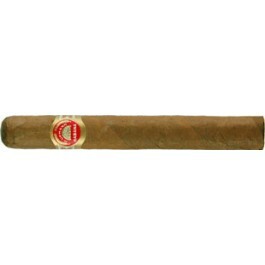 The H.Upmann Regalias is a very good option for a mild to medium cigar when the time is of the essence. • Fairly complex cigar, with cedar, coffee, herbal notes in addition to the dominant tobacco flavor. • Ages very well. 3 years on, the flavors open up even more and add a nice complexity. This cigar simply delivers a great typical Cuban smoke for an affordable price. The wrapper has a nice tobacco smell. Once cut, the draw is on the tight side, but not hindering the quality of the smoke. The aromas at cold are slightly spicy. The cigar lights up quickly and burns well. The first puffs give some aromas of green pepper and wood. The burn line is great and does not require any touch-up. The ash has a nice white color and is holding solidly. The first third of the cigar is dominated by woodsy flavors and coffee. There are also herbal notes, sweetness, creaminess and some hints of toastiness. The cigar is pretty complex, and the flavors are mild in strength. In the middle third, the flavor profile is similar to that of the previous third, with the addition of roasted aromas. This middle third is very pleasant. In the final third, some bitterness appears but doesn't hamper the pleasant smoking experience. In summary, it is a very good choice for an everyday smoke, especially for new comers to Habanos.